I'm a big fan of travel kits for cosmetics and toiletries - they're fabulous for saving space in your suitcase while still allowing you to bring a wide range of sample size products. And even if you're not going on holiday anytime soon, travel packs are a great introduction to a brand's offerings, allowing you to try out a few items before committing to a full sized purchase. Here are three great examples that recently arrived here at Fluffy Towers. ONE An ASOS exclusive, these Benefit travel packs include one full sized product and two luxury samples - decent sized minis, that are well presented in cute yet sturdy packaging. The products arrive nestled on pink straw in a cute candy cane striped box, and you can choose from two combinations - both designed to brighten your skin for summer. The set pictured includes a full sized version of Benefit's That Gal brightening face primer, alongside a miniature Sunbeam - the brand's latest liquid highlighter - and The Porefessional, which minimises pores and fine lines. This set is €29.72. Or opt for a full sized box of Hoola bronzer, which comes with a free mango lip and cheek stain, Cha Cha Tint, and Watts Up cream highlighter - that one's €32.49. Check 'em out here. 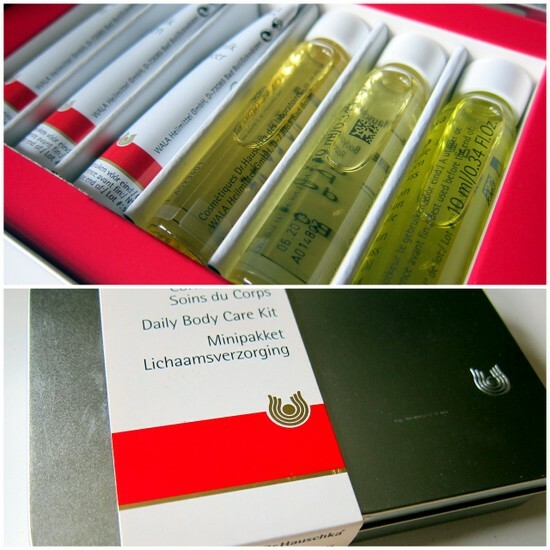 TWO Dr. Hauschka's Daily Body Care kit is a great introduction to the brand's natural organic range. Perfect for popping in your case for a week away, this includes two vials of body oil - rose and lemon lemongrass - along with a lavender bath oil, two body moisturisers - rose and quince - and a little tube of hand cream. It's all housed in a lovely tin case - bath and face care kits are also available. They're all priced between €15 and €25 - find your nearest stockist here. THREE This Burt's Bees Head To Toe Kit contains six of brand's most popular products: Beeswax Lip Balm, Coconut Foot Cream, hand salve, Peppermint & Rosemary body wash (a personal favourite), Milk and Honey body lotion and Soap Bark & Chamomile Deep Cleansing Cream - great value for €16.95. The products smell amazing and can be found at Avoca, Arnotts, Nourish and selected health stores and chemists, nationwide. Have you tried any of these? 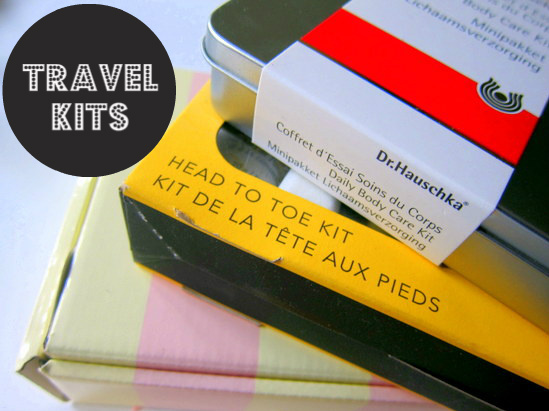 What are your favourite travel kits? You too lady! Yeah I have a bit of a thing for travel kits too - so dinky, not to mention convenient! Adore Burts Bees & benefit - they both look great packs! I'm the opposite- I usually steer clear of travel kits because they usually contain 1-2 things I want and a bunch of stuff I don't- but that Dr. Hauschka one looks good. I'd be interested to try the face kit! I love cute little travel kits, they are so handy and space savers. Love both the ones from benefit and Burts Bees. Happy Weekend sweetie! I love travel kits, they're not only useful for when you're away on a trip but are also great when you just want to try out a selection of products from a company to see what does and doesn't work for you! I love travel kits. I can keep them in my purse or diaper bag for the kids. Burts Bees has some fantastic products. I love them! travel kits are such an essentials.. Hope you are having a wonderful day! I Love travel kits for trying out products! They're usually reasonably enough priced that you don't mind spending the money in order to see of you like products. 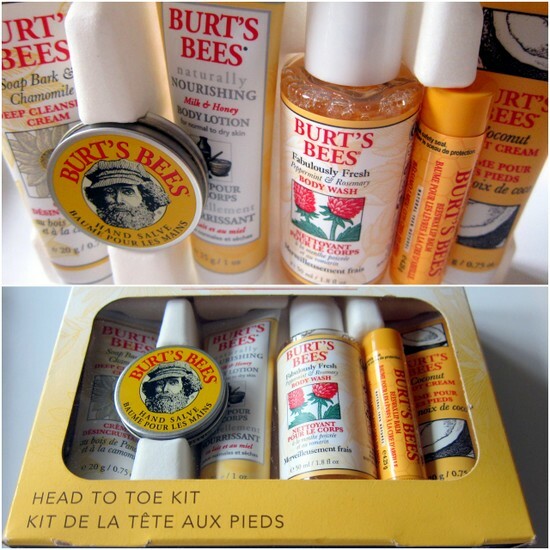 The burts bees ones are great, I found some of my favourite products by buying their travel kits! I love travel kits and I'm happy to see more companies putting their products into one. I've tried the Burts Bees, but not the others. I need to revisit Benefit. It's been awhile since I've tried their products. Thanks for showcasing these. Like the Burt's Bees kit best! I haven't tried any of these, but I want them all. I love travel kits. I love a travel set as not only are the handy for holidays they're a great way to try out new products :) That Benefit set looks great! Will have to try these!